The 15,195 acre Sunflower project is located approximately 7 miles southeast of Williams between County Road 73 and Whitehorse Lake. It began in the fall of 2017 and will likely be ongoing throughout the year as opportunities arise and conditions permit. Fire plays a beneficial role in maintaining the ecological stability of many landscapes including the Kaibab National Forest. Managers use prescribed fire as a practical means to reduce risks associated with uncharacteristic wildfires that can pose significant threats to public health and safety. Officials understand that smoke impacts to air quality may be unpleasant at times, however they can significantly reduce the amount and limit the duration more effectively using prescribed methods as opposed to an uncontrolled wildfire situation with long term effects. During operations, fire personnel and vehicles working in these vicinities will be visible to the public. Motorists are reminded to slow down and drive with heightened caution when passing through active project areas. 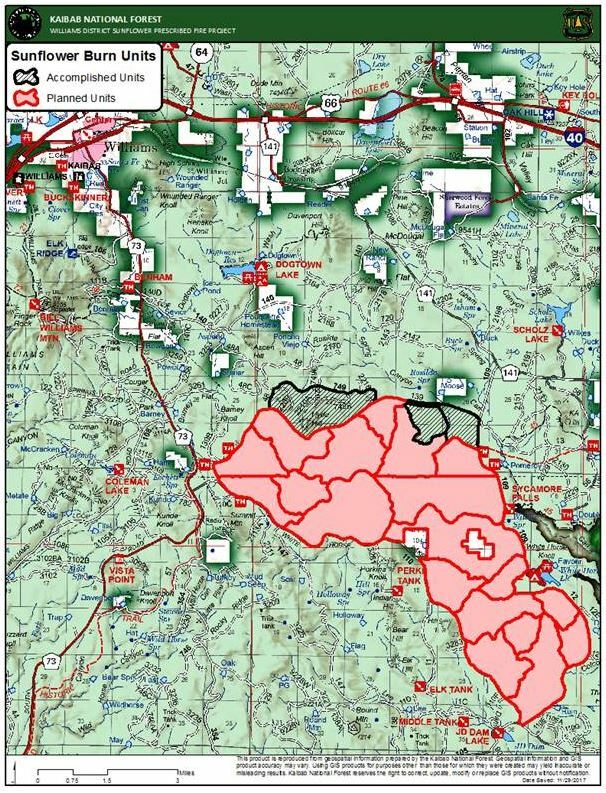 All prescribed burning on the Kaibab National Forest is subject to approval by the Arizona Department of Environmental Quality. For additional information about the Smoke Management Division of the ADEQ and to view prescribed burns authorizations, please visit www.azdeq.gov/environ/air/smoke/index.html. Additional fire information for Kaibab National Forest can be obtained through the following sources: InciWeb inciweb.nwcg.gov/incident/5160/ Kaibab National Forest Fire Information Phone Line (928) 635-8311; Text Message – text ‘follow kaibabnf’ to 40404.